"Today, agroecology is science, agroecology is practice, and agroecology really is truly a social movement," Steve Gliessman said during the investiture. "You need all three or it's not agroecology." In a ceremony that was equal parts celebration and inspiration, Elliott Campbell, associate professor of environmental studies at UC Santa Cruz, was honored Tuesday (January 16) as the inaugural holder of the Stephen R. Gliessman Presidential Chair in Water Resources and Food System Sustainability. Hosted by Social Sciences Dean Katharyne Mitchell, the event attracted more than 75 people from across campus and the community to University Center, where they paid tribute to Gliessman, Campbell, and Alec and Claudia Webster, whose support made the new chair possible. 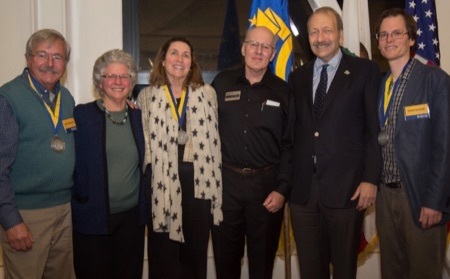 The chair, which honors Professor Emeritus Steve Gliessman, a pioneer of the field of agroecology, was established with a $500,000 gift from the Helen and Will Webster Foundation and matching funds from the UC Regents. The chair will support research and teaching on the linkages between water resources and sustainable food systems, with a special focus on groundwater research, watersheds, and surface water management. Chancellor George Blumenthal noted Gliessman's pathbreaking accomplishments and his tireless promotion of agriculture that is "clean, fair, and profoundly democratic." "Steve was very much swimming against the tide when he first began to talk about agriculture as an ecosystem," said Blumenthal. Today, agroecology is a signature program at UC Santa Cruz, and it is also taught at major universities all around the country, which are "quick to acknowledge that a lot of what they're doing began right here at UC Santa Cruz, and that was with Steve," he said. Gliessman, who joined the faculty as an assistant professor in 1982, received a standing ovation when he took the podium. 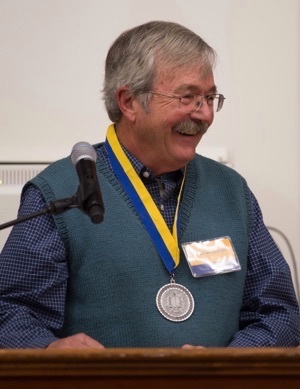 He described the "awesome support" he received as the inaugural holder of the campus's first endowed chair, the Ruth and Alfred Heller Chair in Agroecology. The power of the chair, he said, was that it allowed him to "turn teaching and research into action… to push boundaries, and reach beyond academic protocol." The recognition of the chair, along with the annual financial support it provided, helped Gliessman attract the support of a freshman legislator in Sacramento—then-Assemblyman Sam Farr, who went on to become an influential member of Congress and a decades-long supporter of the Agroecology Program, which became the Center for Agroecology and Sustainable Food Systems (CASFS). Farr, who attended the investiture, beamed from the front row as Gliessman spoke. Also in the audience was Jim Cochran of Swanton Berry Farm, with whom Gliessman partnered in the mid-1980s to develop organic methods to grow strawberries. "Everyone said we were both crazy, and we didn't have any money for research," recalled Gliessman, who used chair funds to launch the experiments that would ultimately prove successful, upending strawberry production on the Central Coast and beyond. "Today, agroecology is science, agroecology is practice, and agroecology really is truly a social movement," said Gliessman, who retired in 2012. "You need all three or it's not agroecology." Gliessman then charged Campbell with "taking it to the next level at UCSC," saying "Complex problems need complex solutions. Put your vision into action." Campbell, who joined the faculty in July 2017 from UC Merced, is an environmental engineer who builds large-scale regional and global models to explore the viability of sustainability initiatives at the intersection of food, water, and energy. "It is beyond humbling to take on a chair in Steve's name," he said. Campbell's models of environmental systems use big data to address questions that are fundamental to agroecology, such as how much food can be produced locally and how much energy is used to pump water to irrigate crops. "I bring something new," said Campbell, referring to an approach that uses big data gleaned from satellites and relies on physics, chemistry, biology, atmospheric and biospheric science, as well as knowledge of human systems. Raised in Santa Cruz, Campbell shared a childhood memory of family outings to pick up beach litter and take it to the recycling center. Joining the UC Santa Cruz faculty felt like coming "full circle," he said. He saluted his colleagues in environmental studies, saying they "don't just talk about interdisciplinary work. It permeates the entire department." The Webster family is well known on campus for its generosity, having funded the renewal of the Hay Barn, the naming of Rachel Carson College, and several endowed chairs for faculty. Alec Webster, president of the UC Santa Cruz Foundation, has known Gliessman since the late 1980s when he was working in a campus lab. When he enrolled as an environmental studies student, Gliessman promptly became his mentor. Claudia Webster acknowledged Gliessman's wife, Robbie Jaffe, the founding director of the Life Lab Science Program, saying, "Steve and Robbie are not just extraordinary professors. They're activists. They walk the walk. These people are our heroes. They are continuing as this driving force for good in the world." Alec Webster followed Claudia, saying, "The thing about Steve is he thinks outside the box. He walks the walk, and most importantly, he walks outside the box. He doesn't pull any punches. We hope Elliott will do the same kind of thing: walk outside the box."